I love to eat E’s for breakfast. The Trim Healthy Pancakes are one of my absolute favorites! I like to layer them with sweetened Greek Yogurt and my easy 2 Ingredient Peach Sauce for a decadent breakfast! I am also a fan of baked oatmeal. I love to make up a big batch so I have leftovers in the fridge to eat throughout the week. This recipe was inspired by an upside down pineapple oatmeal I had at my mother-in-laws this summer. My sister-in-law layered fresh pineapple in the bottom of a cast-iron pan and baked oatmeal on top. It was delicious! I did not have fresh pineapple last week, but I did have frozen peaches! Fresh peaches would also work great in this recipe! 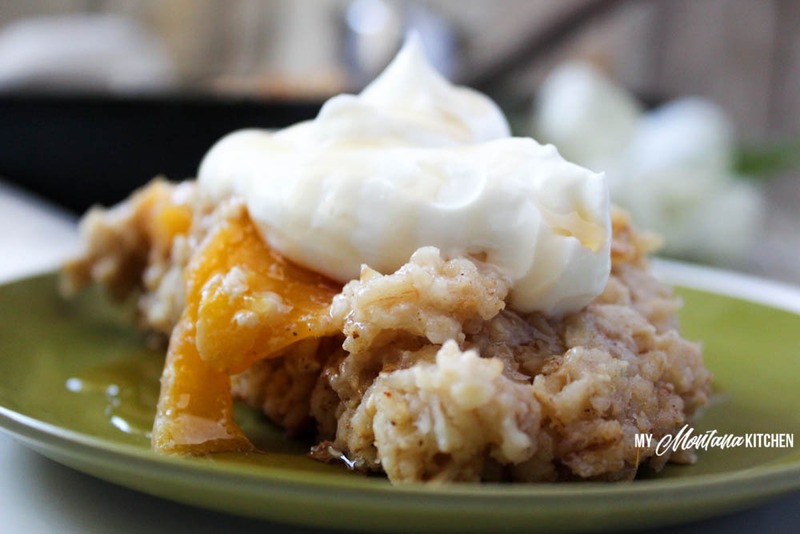 I topped this oatmeal bake with my Copycat 000 Yogurt Recipe, and a drizzle of sugar free maple syrup. I added some collagen coffee, and I had plenty of protein for a rounded E meal that gave me energy for my day! So here’s to more E’s! 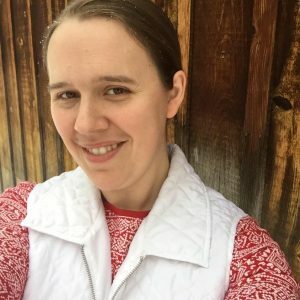 I recently (TODAY) committed to a 100 day on-plan challenge with Jennifer (at A Home With Purpose). If you are interested in joining that challenge, let me know! It will be good for my discipline – and my waist line! I added whey protein to the oatmeal bake for a bump in protein, but that is not absolutely necessary. If you do not use the whey protein, this recipe uses No Special Ingredients! 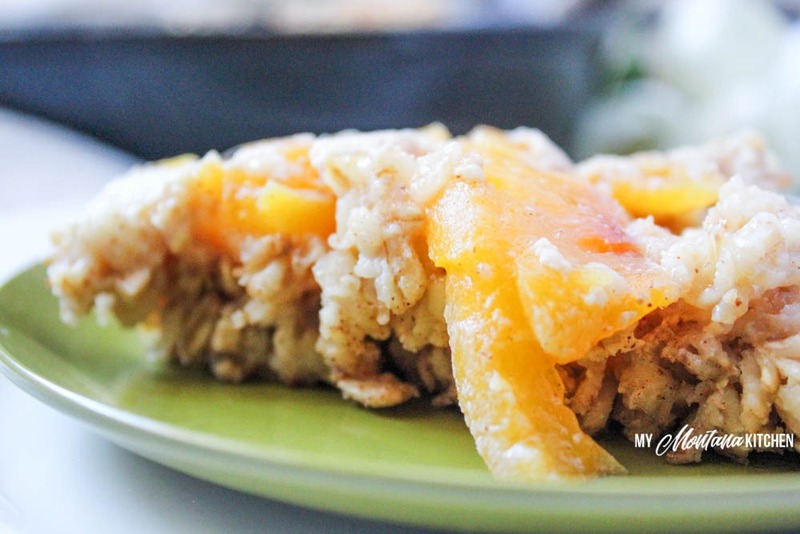 If you love peaches, check out my Single Serve Healthy Peach Crisp recipe! 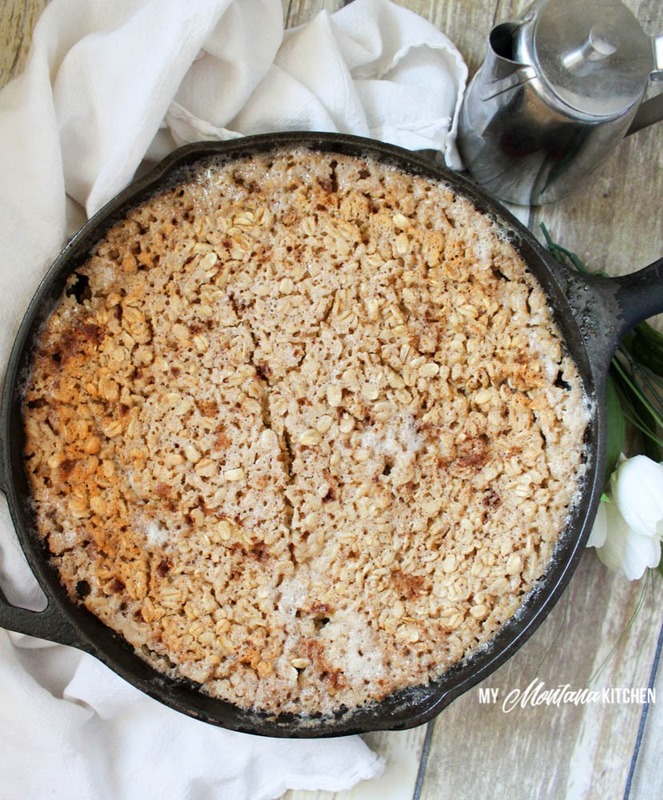 So what do you need for this delicious oatmeal bake? In a large bowl, combine frozen peaches, 1/4 cup xylitol, and 1/2 teaspoon cinnamon. Toss to coat. Pour peaches into a greased 12 inch cast iron skillet. Pour oatmeal mixture over peaches. Bake for 50-55 minutes, or until center is set and no longer jiggles. I have Gentle Sweet. What would the conversion be for the xylitol? Is this ok to refrigerate and eat for a couple days worth of breakfast? Could you use fresh peaches? What kind of pan would you recommend since I don’t have a cast iron one? I would recommend using a glass Pyrex dish – probably a 9×13 or the one slightly smaller than that. I am out of whey! Could I use collagen and if so how much? Is this fat free Greek yogurt? That is what I use, yes. I love the idea of pineapple in this. Could I use canned pineapple in lieu of the peaches? How much do you think?